Reusable cloth Hello Kitty napkin from Red Poppy Crafts on etsy. 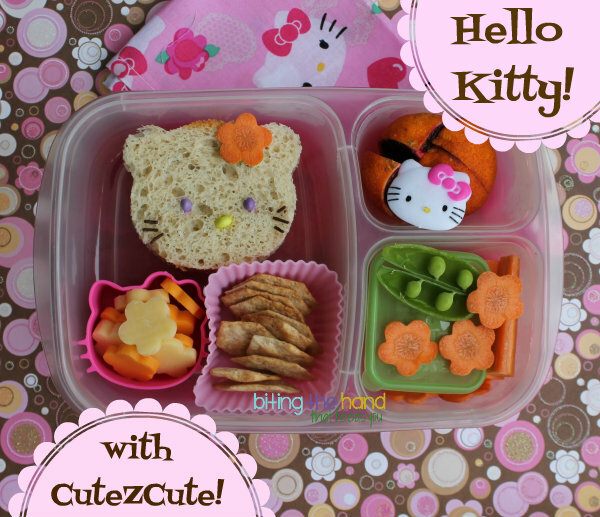 Thursday, 4/4/13 - I used the CuteZCute cutter to make a quick and easy Hello Kitty lunch for my big girl! See? You don't need any special, often-overpriced, licensed tools to make this iconic character! After cutting some Udi's Gluten-Free multi-grain bread, I used PB to "glue" on some India Tree Naturals chocolate vermicelli sprinkles and Trader Joe's dye-free chocolate-covered sunflower seeds to make a face. And a carrot flower for the bow over the ear. DONE! Crazy easy. It took longer to find and arrange the whisker sprinkles than it did to put the rest of the lunch together! 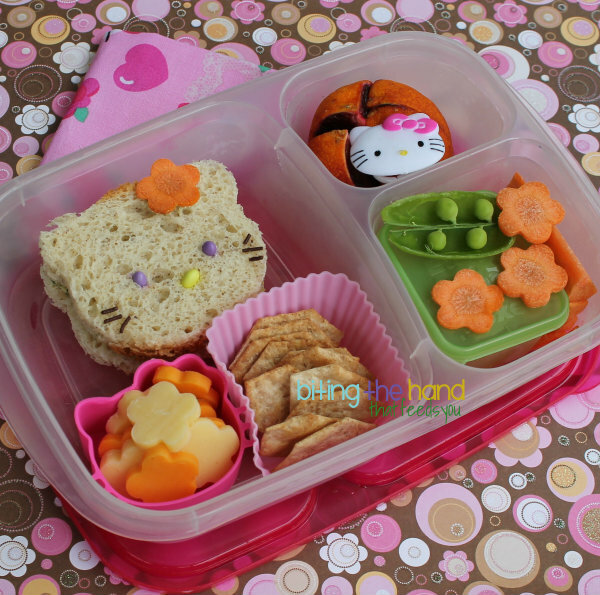 The cheese flowers (cut with a flower veggie cutter) went into a Hello Kitty silicone bento cup (I got mine on eBay,) and I used the same cutter on some organic carrot coins that went in with some carrot sticks and a Mini Dipper with organic Ranch dressing. Super duper cute! Love that lunch!